A volcano in eastern Papua New Guinea has erupted, disrupting flights and spewing rocks and ash into the air. 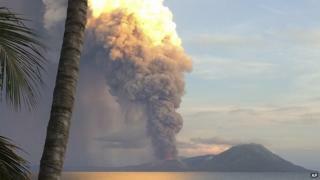 Mount Tavurvur on New Britain island erupted early on Friday, forcing local communities to evacuate. Officials said there have not been any reports of deaths or injuries so far. Local residents of the island's Rabaul district were advised to remain indoors to avoid falling ash. Australia issued travel warnings against visiting the island. Papua New Guinea lies on the Pacific "Ring of Fire" and is home to a number of active volcanoes. The same volcano destroyed Rabaul town in 1994 when it erupted simultaneously with nearby Mount Vulcan. Hotel manager Rodney Aua told AFP news agency that "some people closed their businesses" and were "moving to areas as far away as possible". "Police are also there to make sure looting doesn't happen again like in 1994," he said. The Volcanic Ash Advisory Centre in the Australian city of Darwin said a volcanic ash cloud was now drifting southeast. "The ash was initially blowing to the southwest but has now turned to the southeast," spokeswoman Cyndee Feals said. "We expect it to clip the edge of Australian airspace later today but we don't expect ash over Australia." But a Qantas spokeswoman said flights paths from Sydney to Tokyo and Shanghai were changed to avoid the ash cloud.